Today we will be celebrating a new tradition called Friendsgiving. 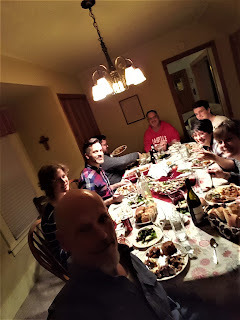 Last year, because we did not travel, we celebrated it on the real Thanksgiving. But this year we will celebrate it on the Sunday before the actual holiday. It is a gathering of friends and family at our house that features all the usual Thanksgiving fare, turkey, potatoes, green beans, salad and desserts. Because it is on Sunday, we will have football on the TV and lots of great conversation. For all intents and purposes it is just taking time around our table to spend with friends and some family that we may not see at Thanksgiving. I think the practice started because we are always travelling to either New York or Minnesota during the holidays. This year sees us travelling West for Thanksgiving and East for Christmas. As I see it, the holiday season is short, and the winter long, so we might as well take advantage of the festival spirit and gather when we can. This sort of kick starts all of it with a feast. This gathering also puts us into hyper clean mode - yesterday saw lots of that - but then we both hit a wall and kind of say "That's it! I can't do anymore. If they're real friends, they'll understand." And they always do. The group we're having always feels very comfortable in our home. As part of the prep for them coming as well as Donna's sister coming for her birthday in December, we are giving our bathroom a much needed upgrade. Paint, new lighting, new accessories and baseboard trim. It was a project full of snafus - probably deserving of its own blog post - but one that is finally done and it looks pretty good. I always say, "I'm not handy," but I also don't give myself enough credit. (Only with this and everything else in my life.) Like many people, I hate the thought of starting a project like this, but when it is done I always end up wondering why we waited so long to carry through with it. So, now that the obsession is done, I think we can finally kick back, relax and enjoy our day. These are some of the closest people to me - kids, brother in-law and partner and a couple longtime friends - so no matter what, it will be a great day. One of giving great thanks for the multitude of things that make our lives so rich. Most of all, the people in it.